This is one of the most imposing and stunning attractions in the whole of Rome and every day it is visited by crowds of people, many tossing coins into the water. As a result, the fountain actually grosses a large amount of money each year and most of this is donated to charity. In 1730, Pope Clemente XII decided to replace the existing fountain, designed in 1453, with one of much more majesty and asked the city's best artists of that time to help him with the project. 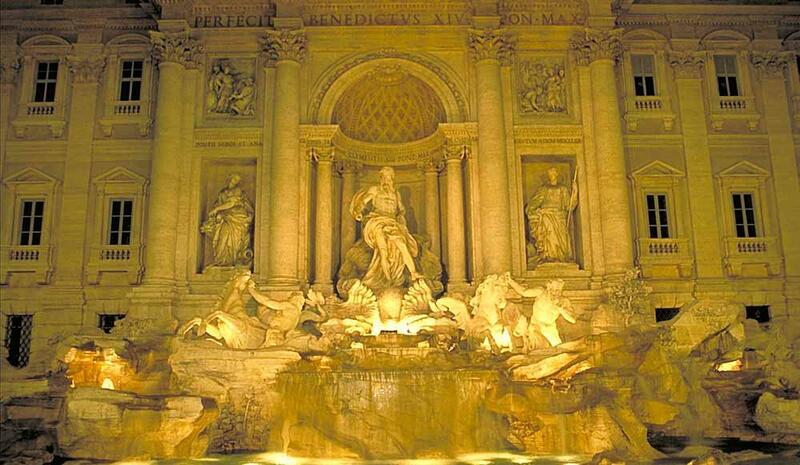 The resulting Trevi Fountain is one of undeniable splendour. The carved, marble centrepiece is a large shell pulled by two sea-horses and driven by two tritons, from which a majestic statue representing the ocean emerges.